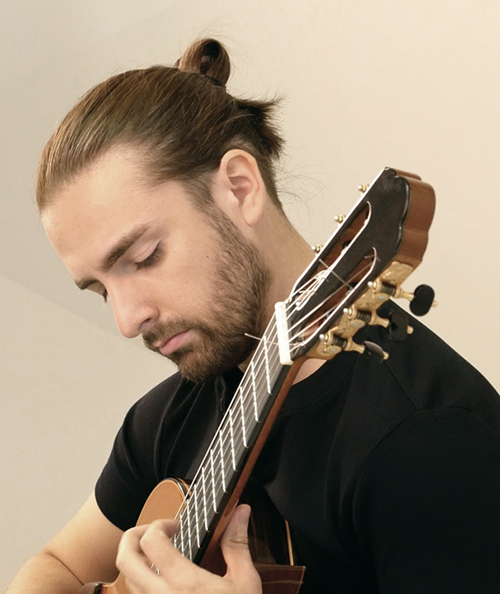 ARSEN ASANOV - was born in 1987 in Melitopol, Ukraine and is a classical guitarist and composer and laureate of numerous international guitar competitions. He is a graduate of the Kharkov National University of Arts in guitar performance in the class of the professor Vladimir Dotsenko. As part of his studies in Ukraine, he has also worked with many great teachers such as Alexander Cherkes, Oleg Popitaylenko and Victor Palamarchuk. From 2008 to 2011, he has worked as a teacher at the faculty of arts in Melitopol State Pedagogical University and in the College of Culture. Many of his students have successfully performed in guitar competitions and festivals and some of which are now continuing a professional career as performers. His concert program includes ethnic music, classical, contemporary guitar repertory and his own compositions. His interest in ethnic music of eastern countries is due to his national roots and his love for the land and area of the Crimean peninsula. Most of his written pieces are miniatures for guitar, but also there are suites and works for guitar duo. The style could be defined as a mixture of classical and fingerstyle guitar music. Since 2011 he has focused on the guitar duo project with Dariya Panasevych (Duo Sempre). Since 2012 to 2016 he has been studied with prof. Marco Tamayo at the "Universität Mozarteum", Salzburg, Austria and graduated both Master and Postgraduate degree with distinction. Debut CD of Duo Sempre "Seven Rings" was released in Salzburg in 2014 and included highlights of their concert repertoire. The compilation of best pieces composed before 2014 "When the Time Stops", together with an additional CD, was released in December 2015. In 2017 Duo Sempre released their second CD "Dramatique" with own transcriptions of harpsichord music from the Baroque era (Recorded in Hamburg, released by Aliso Records). Since 2016 to 2018, as the grant holder of the DAAD (German Academic Exchange Service), Arsen has been studied with Prof. Jens Wagner at the "Hochschule fur Musik und Theater Hamburg" and got a Master degree in a chamber music area with distinction.